Fassinating Fassbender - A Michael Fassbender Fan Blog: Happy 33rd Birthday Michael Fassbender! Happy 33rd Birthday Michael Fassbender! 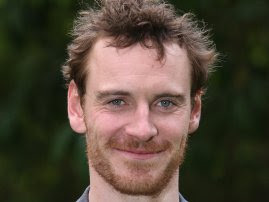 Thirty-three years ago on April 2, Michael Fassbender was born. Today, he is a rising award-winning actor in Hollywood. All of us fans here at Fassinating Fassbender would like to wish Michael a most Happy Birthday and hope he has a blast on this most special day! We ♥ you Michael! Please feel free to post a comment wishing Michael a Happy Birthday! I know the cake looks girly, but it's just so pretty and if it were real, we know he would eat it up! LOL! Happy Birthday Michael, wish you all the happiness and success! Happy Birthday, dear Michael! May it be merry, grand and full of everything you wish for. We're celebrating here in America, too! Here's to your day! Breithlá sona duit and Síochán leat! Oh, and of course Herzlichen Glückwunsch zum Geburtstag! Grattis på födelsedagen! Happy Birthday from Sweden! Anyway, cheers from The Netherlands to Simone for the great blog! Keep up the good work!